A mailbox in Help Scout is like any other inbox: it holds email. Your support team will work together out of a mailbox to answer all of your incoming support requests. Keep reading for a primer on mailboxes, and how they work in Help Scout. When you create your first mailbox, you'll be asked to assign an email address to that mailbox. 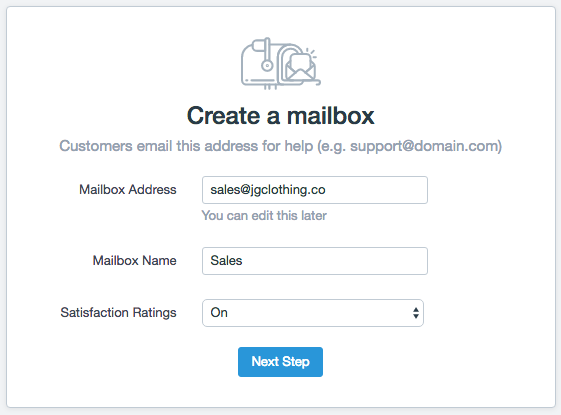 This address should be your catch-all support address (support@domain.com), because you'll use Help Scout to manage your support email going forward. 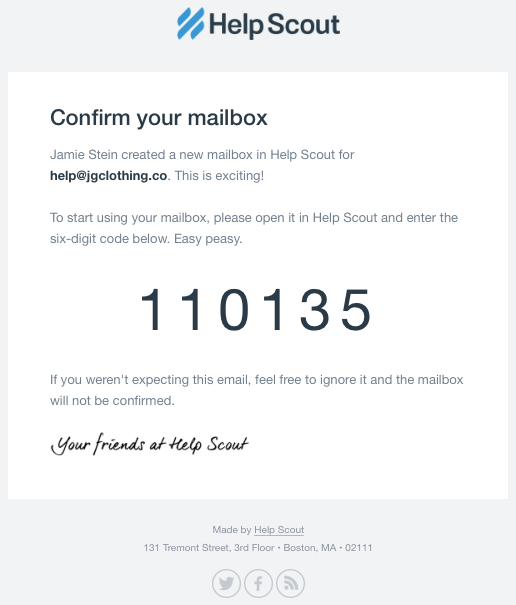 Help Scout does not replace your email provider or your personal email service. How do messages get to my Help Scout mailbox? Each mailbox has a unique identifier, or mailbox alias. It looks something like this: support.32669.2c7fca07cef3df61@helpscout.net. Whenever messages are sent to your alias address, they'll show up in your mailbox. You'll need to setup an auto-forwarding rule in your external support inbox (Gmail, Outlook, your own server) to automatically send new email to your Help Scout mailbox. Can I continue to reply from the original support inbox? Once the auto-forwarding rule is created, you cannot address any email in the original support inbox. We won't have a record of your reply, so the conversation will be in bits and pieces in two places. Send replies from Help Scout only! Which address are my replies sent from? When you reply via Help Scout, your replies can be sent from your mailbox address or from an alias address within your mailbox. For example, if you reply to an email that was sent to help@domain.com (your mailbox address), the customer will see your reply from: help@domain.com. Or if an email was sent to contact@domain.com (an alias address), you can also choose to send your reply from contact@domain.com. The address you used to sign-up with (your profile address) is never visible to customers. Can I sync my outgoing replies to the original conversation in my external inbox? Absolutely. You'll need to use custom outgoing settings to make that happen. See this article for more information. Why would I create more than one mailbox? Additional mailboxes are helpful if your team is managing multiple email accounts (for example, marketing@domain.com, billing@domain.com, etc). Instead of hopping around from inbox to inbox outside of Help Scout, you can manage all of your messages from a single Help Scout account containing multiple mailboxes. Can I use my personal work address as a mailbox address? We know it's tempting, but we'd recommend that you steer clear of creating a mailbox using your personal address. You're going to see some unexpected results if you attempt to email or CC your support address or other Help Scout mailboxes. You'll also lose some features, such as email notifications, and it'll make your external inbox quite useless. See this article for more information. 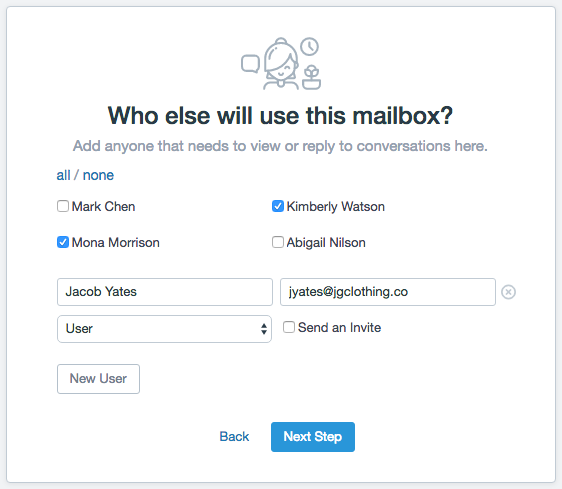 Head to Manage → Mailboxes, and click on the blue New Mailbox button. Fill in your mailbox address, mailbox name and decide whether you'd like to turn on Satisfaction Ratings. Remember, this is the address that your customers will email. Messages sent to this address will be auto-forwarded to Help Scout. Give team members access to the mailbox. You can optionally add new Users just by filling in their names and email addresses. We'd recommending sending an invite email so your new Users can quickly finish the registration process. Set up a forwarding rule for this mailbox. If you need a bit of help, check out our auto-forwarding guides or send a quick email to your IT person. On the next screen, you'll be asked to enter a six-digit code. The code will be sent to the email inbox associated with your Help Scout mailbox (ie. help@jgclothing.co). Your confirmation email will look like the one below. 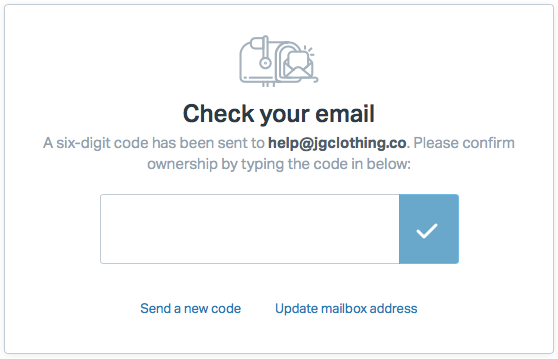 Type the code back into the box in Help Scout, click the blue check mark button, and you'll be directed to your new mailbox.